We pulled into the parking space and hopped out. I slung the camera from my neck, twisting the branded strap so the words “Canon EOS Digital” didn’t show. 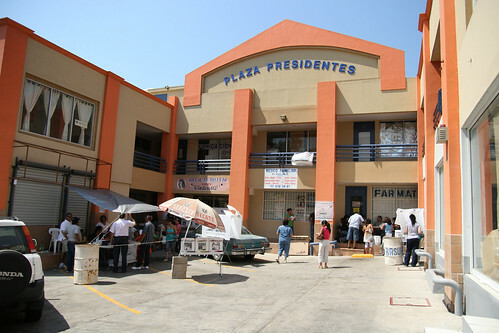 I’m fascinated by Mexican elections. It’s so simple and straightforward. Just paper ballots and a black crayon. 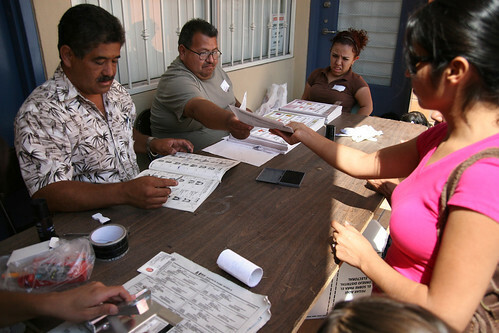 Poll workers check voters’ national ID card to confirm registration records before giving ballots. I watched the 2006 presidential election count in my mother-in-law’s neighborhood. She was serving as a poll worker. Representatives from each party were present, collectively counting and sorting each ballot. The public oversight, caution and security I saw that day inspired much more faith in the final count than the electronic voting machine I would use months later. 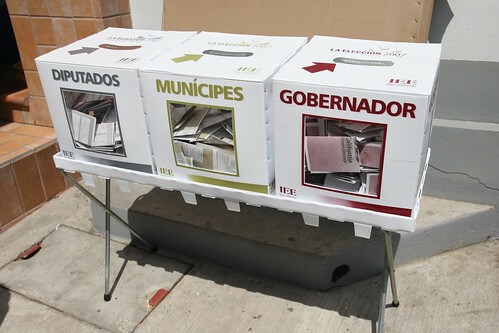 A man slips his votes into the ballot box slots after marking his votes in the white booth. This time, I had my camera. I wasn’t quite sure if I was allowed to be wandering around photographing everything. As I tried to join Rosario in the makeshift voting booth to photograph the ballots, a poll worker asked me to move away. As I framed up a nearby shot, he told me I wasn’t allowed to take photographs. I heard a woman mumbling a few feet away, “Ustedes viniendo acá, cochinando la elección. You people come here making it a dirty election.” I turned and asked what she was referring to. She seemed startled that I was challenging her passive-aggressive muttering. “Qué estoy haciendo mal con mi cámara? Quienes son ‘ustedes’? What am I doing wrong with my camera? Who are ‘you people’?” She didn’t catch the quotation marks in my inflection, and responded by saying “Soy ciudadana como tú. I’m a citizen same as you.” She walked away with her daughter before I could say any more. 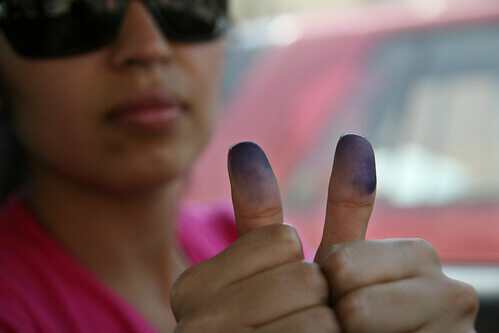 Purple ink marks voters’ thumbs after leaving their prints in the registry. 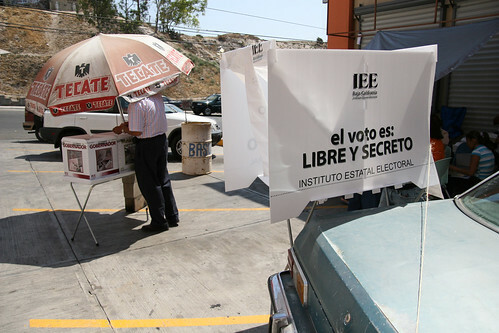 The people that told you to move away from the ballot box told you that because the only ones allowed to do so (at least that close) are members of the press acredited with the IEE (state electoral institute) for this election. And well, that other woman just saw a “gringo” photographing her election, it’s nothing personal. Ridiculous, nevertheless.